I took Effigy: Devil of Caroc, but take whatever you like for that. Skills: Whatever you want really. I like to have a moderate Athletics and set my AI to use when near death. Points in alchemy if you wanna use drugs. Passives I like to spread them around, but if you plan to use Giftbearer’s then pump History. **Levels 7-9 can be taken in any order, though this is the order I took them in. **You can take Lightning Strikes then respec to Swift Flurry later, if you feel you aren’t critting enough early on. **Spirit Frenzy can be taken at lvl 10, however stun overrides staggered. Also if you use a rogue tank for persistent distraction, this will remove it so bear that in mind. **I'm undecided on which is better out of Interrupting/Enervating Blows, but need to drop one for The Long Pain. Cloak: Still not set on this slot yet; for pure damage you could go Violet Redemption; Nemnok’s will save you in a pinch, but will make you even more squishy; Giftbearer’s or (Greater) Protection for the will; (Greater) Deflection is probably the overall safest choice. Trinket: Waidwen's Sundial/Eye of Rymrgand. Both strong defensively, Sundial also has a debuff though this can be applied by a party member. Per rest so if you don't like abusing rest (I don't) then save for big fights/rough situations. Scordeo’s Edge: You will want to go to Ashen Maw early. Put it in your main hand and leave it there. Rust’s Poignard: Obtainable early, though the fight can be tough. I was able to do it at lvl10 without much trouble, so I’m sure it can be done earlier. Grave Calling: BiS OH for skeleton fights. +15 accuracy vs vessels makes this the obvious choice, as a bonus we can summon minions with it too. This will also probably be your main hand until you get Scordeo’s. Modwyr: Solid weapon, however the action speed buff doesn’t apply to your other weapon whereas Rust's does (the lashes do though). A solid option pre Scordeo/Rust, also against Fampyrs. Aldris Blade of Captain Crow: Good synergy with our high crit chance. If you are having trouble with healing then you will like this sabre. Beza's Toothed Blade: Only one reason to use this, and that is Veil Piercing. Veil-Touched (all ghosts have this passive) grants -50% damage taken and 100% incoming crit to hit conversion. Only way to circumvent this is with Veil Piercing, showcased in the Onadere bounty video below. Tarn’s Respite: Very good early-mid game weapon due to +1 PEN and a cold lash. The upgrades are only really good against bosses. Edit: After playing through BoW I have made some adjustments and removed some weapons, because honestly Scordeo/Rust can't be beat (outside of immunities and ghosts). Even the 21 slash/pierce armour snow bears couldn't slow me down. I was even able to prone-lock the final boss at half health thanks to Rust and a good Blade Cascade proc; fight ended about 15 seconds later. For other gear, there aren't many changes. The Helm of the White Void provides us +10 accuracy on Stunning Surge, so is a very strong contender for the head slot. Looks weird if you're not also wearing the Guardian's Plate though. Added trinket recommendations. New ring (Prosperity's Fortune) from the Deck of Many Things DLC is interesting, however you'd have to drop the ring of regen. Also appears to be no in game indication whatsoever of how much hit to crit chance it gives, so can't recommend at this stage. Most of this gear is obtainable early, providing you know where to look and have the cash. Most of the expensive ones can even be stolen with mechanics 14, which is nice. My fight against the Kraken was quite bizarre; hopefully you find it as amusing as I did playing it! I had to equip Eder with the Bounding Boots to get him out after. It is very easy to stack Scordeo against, the results of which I show at the end. So as you can see the build is still very strong after the nerf to SS; basically don't spam it until you have high Scordeo and/or they are sufficiently debuffed. So, how it all fits together. Stunning surge will provide us with 2 mortification if it crits, this used to apply to both attacks meaning it was possible to generate Mortification (patch 2.0 limited it to one refund). It also gives you 2 wounds; though this is likely a bug. This is why we want to maximise our crit chance, and is why Scordeo’s Edge is so good here. Each hit with it grants +2 accuracy, which stacks. Swift Flurry and Heartbeat Drumming have a chance to trigger an additional attack when you crit; the important thing to note is that the additional attack seems to always be with the main hand (which is why Scordeo’s must be in MH slot), and they can proc several times on a single attack (most I’ve seen is 8, sometimes you will literally make a mob explode with a single hit). This means it is very easy for us to stack our accuracy, leading to more crits, more SS spam, and more free attack procs! I've also added in Instruments of Pain, which allows us to hit from a distance - don't use the Long Pain as it will replace your weapons, just wait for the upgrade. Against some bosses you may want to not use it, as you can't flank from range. Next up we have Lion’s Charge, which gives +15 accuracy (note this doesn't stack with Priest's Devotions of the Faithful). The description states it is only for the first hit, however it is currently bugged and will last for the duration of the encounter. This will eventually get fixed, but even then it will still be a solid choice as you want to get those free attacks pumping ASAP. Sprint is also great for rushing the backline at the start of a fight if you want to take out a caster quickly, and repositioning in general. Bloodlust and Blood Thirst to increase our AS when we kill things, which will be alot. Bloody Slaughter and Barbaric Smash for finishing off low health enemies. Rust's Poignard - Shank gives 3% AS per stack against flanked enemies (also works on your MH, though tooltip it doesn't always show on the weapon), so you will want a Rgoue tank and/or Cipher to spam Phantom Foes. Lay Low is also very powerful when it procs (prone and -10 all defenses). It even works on bosses so if you get a Blade Cascade proc you can lock them down for a solid duration (Salvation of Time extends it). For basic fights I have a script handle pretty much everything for me, which I can upload if anyone is interested. Athletics when near death - auto cast frenzy, swift flurry, and instruments of pain - if mortification > 5 then use SS on lowest deflection - if rage > 5 AND enemy is near death then use barbaric smash. Activate sprint at beginning of combat after your auto cast buffs and pick your first target. You will be disgusted at how efficient this is when you get a Blade Cascade proc. Note: This is no longer strictly recommended in 2.0. Take control early then once the momentum has built up let it spam. I think that's everything, if you have any suggestions or critiques I'd love to hear them! Edit: Updated for 2.0, added a bunch of videos, changed some formatting. Edit: Can't believe I'd never tried out The Long Pain/Instruments of Pain before, so much fun! Take them at 15 and 20. Edited by thundercleese, 04 August 2018 - 03:25 PM. 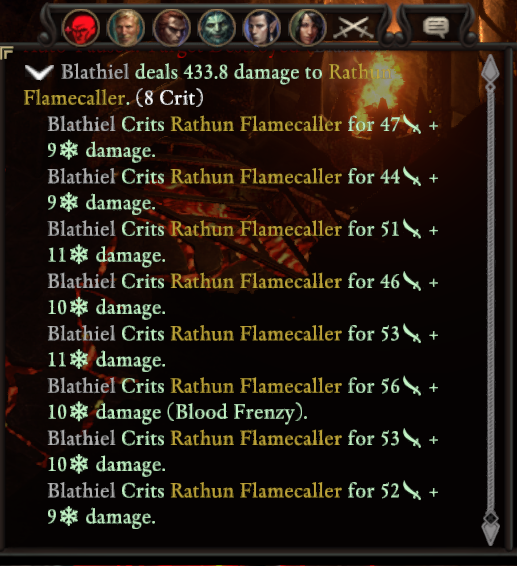 One thing: you cannot get the DoC breastplate when you also chose to sacrifice her to the blood pool. Afaik Stunning Surge only refunds mortification and doesn't give wounds. Edited by Boeroer, 31 July 2018 - 11:42 PM. She needs to have died or spared the dudes life. How she dies doesn't matter. I'm sure I've seen my wounds jump up to 10 after using it. Though tbh as I can't see my health I could have also taken a heavy hit. Or frenzy ticks. Will remove it from the post for now though to be safe. Edit: Okay so I just tested without Frenzy and gained 4 wounds from a single use, no damage taken. Possibly a bug? Will add it back in. Edited by thundercleese, 01 August 2018 - 12:04 AM. That's nice actually. Great for Shattered Pillars to gain wounds without the need for auto-attacks I guess. Edited by Boeroer, 01 August 2018 - 02:59 AM. I added this build to the list. I didn't play at release so it may have changed at some point. Yeah it's not such a big deal for this build as unless you take something like Blade Turning you're not spending wounds at all. It does help reach max wounds at the beginning of combat though, which is nice. Thanks for adding to the list. Aren't the extra Wounds due to Helwalker starting combat? The description mentions 1 Wound, but I seem to always start combat with 3 at level 10. So maybe the amount scales with PL? Helwalker gets 1 more wound at start of combat than regular monk. Berserker frenzy ticks also grant wounds, which is why I always start my self buffs with frenzy to squeeze a little more initial duration on flurry. I did a quick test last night on a lvl16 hired adventurer: Start combat in stealth with 5 wounds, didn't activate frenzy, ran up to a squishy archer and used stunning surge; gained 4 wounds, took no damage. Edited by Boeroer, 01 August 2018 - 10:44 PM. I think I tried this out at one point during my testing and it didn't cancel it, can't remember 100% though. May check it out later tonight if I have time. Edit: Wait no, that was testing with the sceptre modal, which didn't cancel dance. Should work with Berserker too then. Edited by thundercleese, 01 August 2018 - 11:28 PM. No need: I just tested it and the self damage will not cancel Dance of Death. I also remeber reading this in one of the first patch notes after release, but I wasn't sure. Now I am. Edited by Boeroer, 01 August 2018 - 11:39 PM. I can test it for you if you want, Boeroer. I've been knocking around build ideas for an RDC run anyway, and this sounds like a pretty fitting concept for a Watcher who was dishonorably discharged from the Ruquapa for his drug habits. Just added a video of a very interesting fight against the Kraken (just finished a bug report on it). Also at the end I show just how high you can stack Scordeo's. Edited by thundercleese, 02 August 2018 - 03:36 AM. @Ascaloth: that's nice, thank you. @thundercleese: do you also have issues with Barbaric Blow (or upgrades) + Torment's Reach? When I use Torment's Reach I nearly always get the 20% bonus of Barbaric Blow - even the +50% when I crit with Torment's Reach. As if the bonus from Barbaric Blow was given to my char permanently. I'll try it when I get home this afternoon. Have you noticed it on other skills as well or just Torment's Reach? I'm not currently using TR so will check it on SS first then respec and try out TR. So just tested with both SF and TR, both before and after using BS for the first time in combat; neither got any bonus from BS. Could be it was fixed in the patch, or could be something specific to the build/gear/encounter for you. So it's established that the scepter modal and Berserker Frenzy doesn't cancel Dance of Death; how about self damage from equipment? Specifically, I'm thinking stuff like Furrante's Breastplate, Voidwheel and Wicked Beast. Currently theorycrafting the Berserker/Nalpazca build I said I would do, and I'm leaning towards something that's super-tanky for the first seconds of an encounter, just long enough for Enduring Dance to be worth the investment even if it gets canceled later in the fight. I think they fixed Dance of Death (and also Mirrored Image, Gilded Enmity, Ironskin, Wizard's Double) in a way that only attacks that do a proper attack roll and deal damage will count. All self damage stuff does no hit roll - so I suspect (only suspect) that they all work fine with Dance of Death etc. Edit: Ha! Pushing this build over to the "hot" category. Edited by Boeroer, 02 August 2018 - 10:46 PM.